Anchored securely in a quiet cove, kicking back and counting stars … it’s what every sailor dreams about. The Sunshine Coast, extending over 90 miles north of Vancouver, British Columbia has many such coves where dreams can become reality. 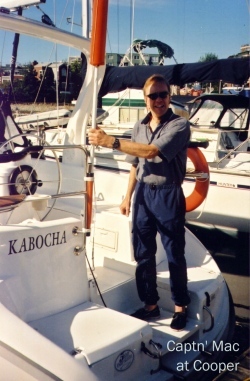 Sandy, my partner, and I chartered Kabocha, a 31′ Hunter sailboat from Cooper Boating Center on Granville Island, Vancouver for a week in September. Our destination was Princess Louisa Inlet, which we’d heard for years described as one of the most spectacular fjords in the world. The Inlet terminates at beautiful Chatterbox Falls, which tumbles from granite more than 120 feet into the sea below. Each night along the way our dream became reality, starting in Plumper’s Cove Marine Park, just 20 miles from Vancouver. This lush park provides a well-maintained trail through an old forest of Douglas Firs, which rise majestically toward the 600-foot summit of Keat’s Island. Our second night found us in Smuggler Cove, aptly named as the hideout of Larry Kelly, “King of the Smugglers,” who ferried unemployed Chinese laborers to the U.S. for $100 a head after the railroads were completed across Canada. The entrance to this cove can be intimidating to the first-time visitor with rocks to the left and rocks to the right just a boat-length apart. Inside, ring bolts in the rocks are provided to accommodate the many boats that make this marine park a mandatory stop on a Sunshine Coast cruise. We took a dingy ride around this quaint little cove completely surrounded by hills, trees and rock cliffs. The next day, a shortcut to “the falls” took us past Pender Harbour and up Agamemnon Channel. After a slight diversion down Sechelt Inlet to the Egmont Marina for water, ice, wine, and showers, we motored five miles into Prince of Wales Reach to Dark Cove, a good starting point to reach our destination the next day. After a night of star gazing in the lee of a small islet, we sailed up several Reaches in light winds to Malibu Rapids, the entrance to Princess Louisa Inlet. These rapids are designated as “dangerous” and rightly so with currents up to 10 kts. During our navigational briefing back at Cooper’s, Rick recommended we enter at slack tide, plus or minus a half-hour. We took his advice but even then, the current tugged at the wheel as we navigated the S-turn rapids. The Malibu Club, a complex of rustic lodges and cabins, sits alongside the rapids with its giant totem pole keeping a watchful eye out for boaters who violate the plus or minus half-hour rule. During the 40’s and 50’s, the Club was a retreat for Hollywood movie stars; it is now a Christian Church Camp. Because of the rapids, I suspect a marine-repair facility would do well in this location. Once we covered the remaining 5 miles to the falls, several options were available for over-nighting: anchoring in the current at the base of the falls, anchoring and tying off to stern pins, or tying off to a dock. Considering the brief time we had for our visit, we chose the dock, just a 10-minute walk to the falls. The “Bear in Area” sign at the trailhead prompted us to return to the boat for the air horn and some signal flares. Even if these did not deter the bear, we wanted other boaters to know where to look for our bodies! Had we had time, we would have climbed the two-mile trail to an old trapper’s cabin, which we were told provides outstanding views of the inlet. James (Mac) MacDonald purchased about 5% of this fjord in 1926 after he struck it rich as a prospector in Nevada. In 1953, Mac turned his land over to the yachtsmen of the Northwest. Unfortunately, the remaining 95% of the land is owned by a lumber company, which was helicopter-logging the surrounding hills during our visit. Anti-logging comments in a guest register at the dock seem to favor Mac’s philosophy. In 1972, in his 83rd year, Mac spent his last summer on his houseboat at the falls. He died in 1978. Near the end of our sailing day, we pulled into a dock to top off our water and fuel. Unfortunately, while I was topping off the water, the attendant was topping off our diesel tank — with gasoline. OOPS! Since diesel engines do not run well on gasoline, we had to pump out 93 liters of mixture and replace it with diesel fuel. We learned a valuable and costly lesson here: never assume the attendant knows whether your engine is gas or diesel. At the conclusion of our trip back in False Creek, I followed the hose back to the pump, hand-over-hand, to ensure it said “Diesel” before I allowed the attendant to start pumping! Following our fuel fiasco, we motored back into Agamemnon Channel to a quiet little cove called Green Bay. We were the only boaters in the cove listening to the sounds of a small waterfall superimposed on the sounds of silence. The next day’s forecast called for strong winds from the south-east increasing to gale-force 35 kts by late afternoon. Since we were headed that direction we decided to motor all day to reach Gibsons Landing so we could tie off securely to a dock while the gale blew through. Dinner at Gibson’s Yacht Club seemed like a good idea after a day of wind and rain. 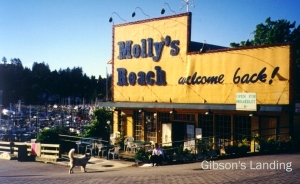 We enjoyed the small-town atmosphere of Gibsons. Gale-force winds generate big waves, even when winds drop to a manageable 25 kts. 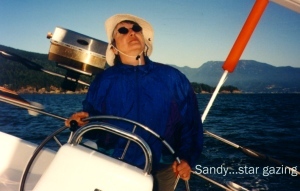 Our last day was a very exciting sail into English Bay with following winds and seas pushing us along at 8 to 10 kts under a full main. Forget the quiet coves, I’ll take the adrenaline rush of surfing 10-foot waves! 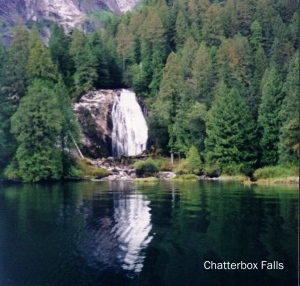 If you haven’t been to Chatterbox Falls, I would highly recommend it on your next cruise on the Sunshine Coast. And do take time along the way to anchor in those quiet coves, kick back, and count the stars. With a little luck and a bit of wind, you may also get a chance to surf the big ones. We’ll be dreaming about this trip for a long time. Note to sailors: Prevailing winds are from the northwest and much of the trip up the Coast can be directly into the wind. Also, the Reaches along the way may not have sufficient wind to sail, so anticipate a fair bit of motoring. If a motor-yacht is out of the question, consider taking at least seven nights to visit the Falls from Vancouver. Our six nights felt a bit rushed; one more cove would have been just right!